I have to admit, I have become seriously obsessed with necklaces recently. I have never been a huge jewellery person, maybe it is because I often end up with ear trauma when I try to wear earrings and I'm way to clumsy to wear anything pretty on my wrist - it will end up snagged on a door handle or rogue tree branch within a few seconds of wearing it. Maybe I should start looking where I'm going, instead of looking around wildly in all directions like a crazed meercat. But I have always had a fondness for necklaces, despite the fact that I often forget to take them off before I go to sleep, and end up choking myself. 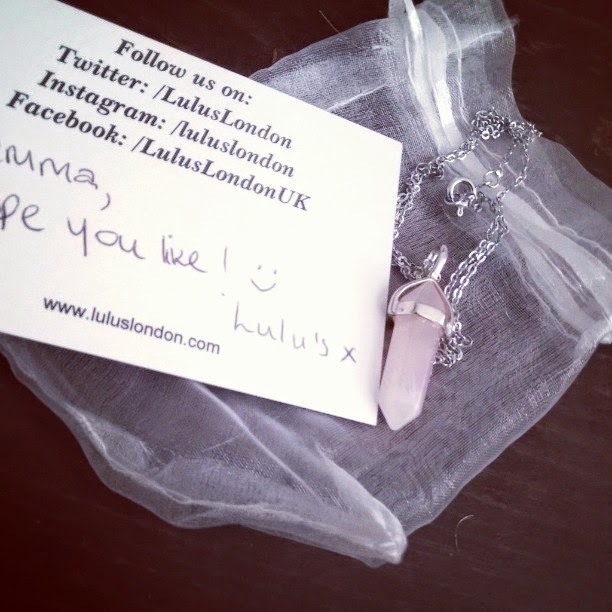 So when the lovely girls at Lulu's Boutique, got in touch and asked if I would like to review their fabulous Rose Quartz necklace*, I skipped around the room a little bit. I love the strong geometric shape, that is juxtaposed with the delicate soft pink shade and delicate chain, and I love how the pendant is held in place, it s so interesting. In recent months, I have really moved away from bold statement necklaces, instead choosing, more simple and chic pieces, and this beauty from Lulu's Boutique, is sure to be a firm favourite over the holiday season. At just £10, it is an absolute bargain, for the amount of wear anyone could get out of it. How lovely does it look against the placid blue of my sporty tee? And look how delightfully delicate that chain is, just look at it!! I am so in love with it and can't thank the lovelies at Lulu's for sending it to me. 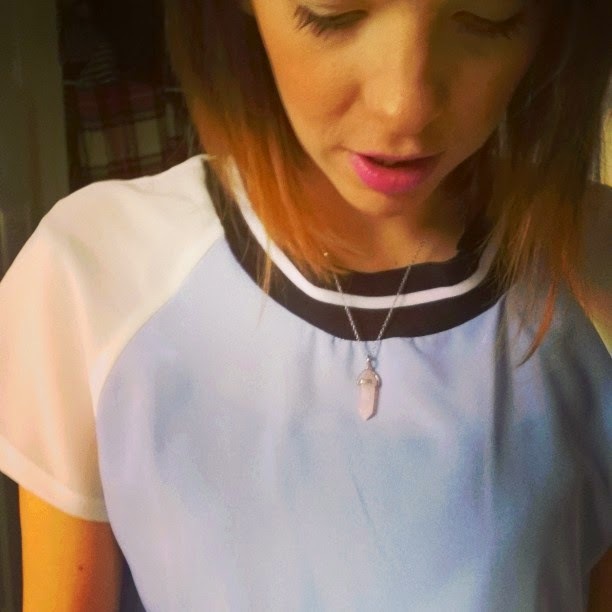 Don't forget to follow them on Twitter with @LulusLondon, to keep up to date with all of their fabulous new arrivals. They have some party dresses to die for, there is a couple of black lace numbers that I definitely have my eye on. What have you been loving thins week? *Necklace provided by Lulu's London for the purpose of this review, but all opinions are my own. This looks SO gorgeous, I would love this. Wow such a pretty necklace! I've been looking for such a necklace forever, but with these golden glitter stones, I don't know what they're called. Anyway, yours looks great against the pale blue shirt!